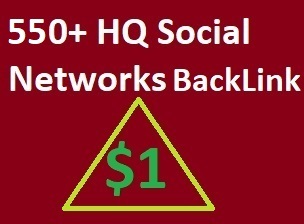 I will submit your URL 550+ HQ social networks profiles and rank higher on search engines. Currently, we accept only one URL with no Keywords for this service. If you have more than one link then please buy multiple services or check extras. The basic order we complete in 3 days maximum. submit your url 550+ HQ social networks profiles and rank higher on search engines is ranked 5 out of 5. Based on 19 user reviews.